College fantasy football diehards are relishing a Golden Age of quarterback production. Since Tim Tebow’s incredible sophomore season in 2007, a plethora of strong armed and elusive runners have produced extraordinary fantasy seasons: Sam Bradford, Cam Newton, Robert Griffin, III, Johnny Manziel, Jameis Winston and Marcus Mariota. Last year, Lamar Jackson continued the dominance of the dual-threat signal callers, capturing the Heisman Trophy. 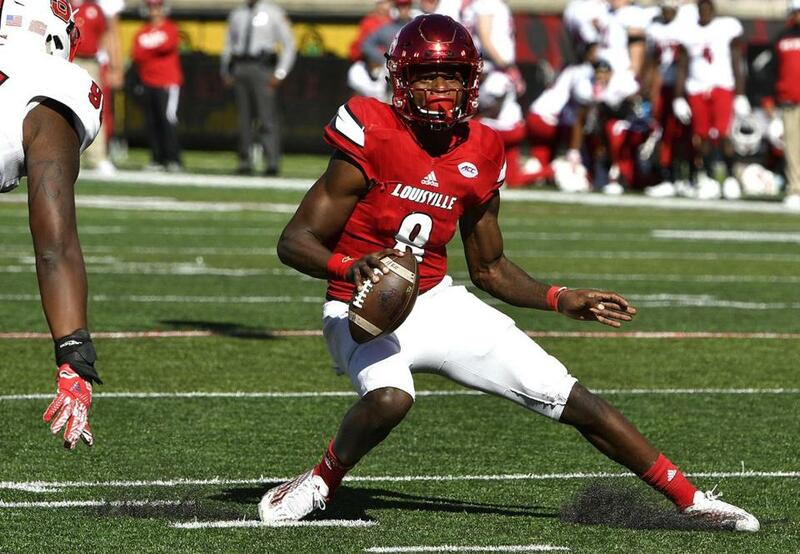 The dynamic Louisville leader passed for over 3,500 yards and tossed 30 touchdowns. However, he reached fantasy Valhalla on the ground with 1,571 yards rushing and 21 touchdowns. The electric playmaker gained 10 pounds in the off-season, and coach Bobby Petrino hopes the additional weight helps Jackson withstand the physical pounding of the upcoming campaign. Only Ohio State running back Archie Griffin (1974 & 75) has captured back-to-back Heisman trophies, and the reigning frontrunner is not likely to win another in 2017. Nevertheless, Jackson’s weekly numbers warrant the first selection in all drafts. The post-Dak Prescott era began slowly in Starkville, Mississippi: The Bulldogs lost five of their first seven games while quarterback Nick Fitzgerald mastered coach Dan Mullen’s system. At 6’5” and 230 pounds, the junior is one of the best two-way competitors in the nation. He totaled 37 touchdowns last season while passing for 2,423 yards and rushing for 1,375. Fitzgerald eclipsed over 100 yards rushing in eight contests—including a season high 258 vs. in-state rival Ole Miss—and surpassed 300 yards passing in three games. The Bulldogs leader needs to work on his accuracy, completing only 54.3% of passes last year. During the off-season, Fitzgerald trained closely with Mullen and quarterback coach Brett Elliot to improve his passing acumen. College football fanatics need not worry about any shortcomings in Fitzgerald’s passing, and instead, delight in the incredible statistics posted each week. How well did Quinton Flowers play last season? The dual-threat senior earned the American Athletic Conference Offensive Player of the Year, Birmingham Bowl MVP, Walter Camp Player of the Year Semifinalist, and named a candidate for both the Davey O’Brien and Johnny Unitas Awards. The USF star became the first-ever 2,000-yard passer and 1,000-yard rusher in the state of Florida history. He rushed for team-high 1,530 yards—the fourth-highest in FBS history by a quarterback—and scored 18 times. In the air, the Bulls field general passed for 2,807 yards and tossed 24 touchdowns. He guided South Florida to an 11-2 record as the Gulf Coast offense finished fourth in the nation in scoring while averaging 43.8 ppg. Seven starters return on offense, and new coach Charlie Strong plans on incorporating an up-tempo scheme to take advantage of his senior’s uber skills. If the Bulls go undefeated and win the AAC, Flowers will surely receive a plane ticket from the Heisman Trust to New York City. Coach Mike Leach’s Air Raid attack annually harvests a plethora of fantasy points from the quarterback position for college football diehards. A walk on for the Cougars as a freshman, Luke Falk earned a scholarship, and eventually, became the starter in Pullman, Washington. During the past two seasons, the senior has been one of the best hurlers in college football: He has passed for 9,029 yards and completed 76 aerial strikes. An incredibly accurate passer, Falk has connected on an outstanding 68.8% of his throws for over 10,000 yards during his campus tenure. With a calm demeanor, unshakeable confidence and impressive leadership skills, Falk is the perfect triggerman for his innovative Coach. The Cougars return 16 starters from last season’s 8-5 (7-2 PAC 12) team which scored 38.2 ppg. and finished third in the FBS averaging 362.4 p-ypg. Washington State employs one of the deepest running back stables in the country and a good core of playmakers at receiver. Falk can anchor any fantasy owners club in 2017. The Sooners lost three tremendous offensive playmakers (Joe Mixon, Samaje Perine and Dede Westbrook) and long-time coach Bob Stoops retired. Despite the turnover in Norman, Oklahoma, new coach Lincoln Riley, who was the offensive conductor, will lean on senior Baker Mayfield to write a new chapter in Sooners history. At 6’1” and 215 pounds, the wizardly competitor has been prolific as a college player and a two-time Heisman finalist. He has averaged 3,833 passing yards, 291 rushing yards and 44 total touchdowns the past two crusades. Despite lofty college production, NFL scouts differ on the Oklahoma field general’s professional potential. He extends plays with his legs and throws well on the run but lacks prototypical arm strength and ideal measurements. In February, he was arrested for public intoxication and disorderly conduct, required to complete an alcohol education program and performed 35 hours of public service by the university. Mayfield is motivated to prove his critics wrong and impress NFL organizations this year. Fantasy fans will enjoy Mayfield’s weekly statistics all season. The Buckeyes fell flat against the eventual National Champion Clemson Tigers in the Semifinals last year, losing 31-0. J.T. Barrett possibly played the worst game of his career, completing only 19 of 33 passes for 127 yards and two interceptions. Do not evaluate Barrett on the performance: He is a great college player. The fifth-year senior enters training camp as the first three-time captain in Buckeyes history and has compiled a 26-4 record as a starter in Columbus, Ohio. He is also one of the most accomplished signal callers in Big Ten history. Barrett is only six touchdowns away from surpassing Drew Brees’ conference record of total touchdowns (106) and has passed for 6,381 yards and 69 aerial strikes. A remarkable runner, he has also rushed for over 2,400 yards and scored 31 times. The Buckeye’s leader has twice won the Big Ten’s Griese-Brees Quarterback of the Year award (2014 & 2016). Finally, his intangibles—temperament, acumen and processing—provide an integral supplementary dimension to his natural athletic ability. Entering the forthcoming campaign, there is no denying that Barrett is the unquestioned leader of the offense, and the most crucial competitor on the roster. Fantasy fanatics will be greatly rewarded with the Buckeye field general in lineups. The Cowboys are loaded on offense. 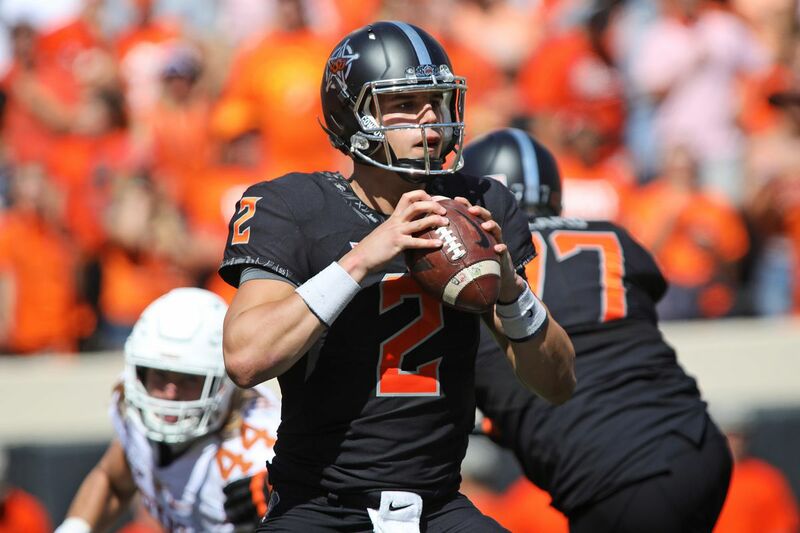 Last year, Oklahoma State finished 14th in Total Offense while averaging 324 passing yards per game and 38.6 ppg. With receivers James Washington, Jalen McCleskey and Marcell Ateman returning, Rudolph has an elite corps of playmakers to attack Big 12 opponents. The 6’5” and 230-pound senior ranks among the best all-time quarterbacks in school history, leading the Cowboys to 22 victories in 28 starts while throwing for 55 touchdowns. He has passed for 7,861 yards the last two seasons, and is one of only two returning quarterbacks in the Power Five conferences to exceed 4,000 yards last year. Rudolph is the only signal caller in the FBS to average more than 34 attempts per game and throw less than five interceptions, finishing the season with a 28:4 TD:INT ratio. One of the more intriguing quarterback prospects entering the upcoming crusade: Rudolph possesses the size, mechanics, poise, arm strength and pocket awareness that NFL teams covet. He also makes the difficult throws, reads progressions well and is a polished leader. Big 12 defenses are perpetually benevolent to opposing aerial assaults (and quarterbacks), and Rudolph will surely soar over the meager opposition.